Payment processing and point of sale (POS) systems are vital tools for small businesses. 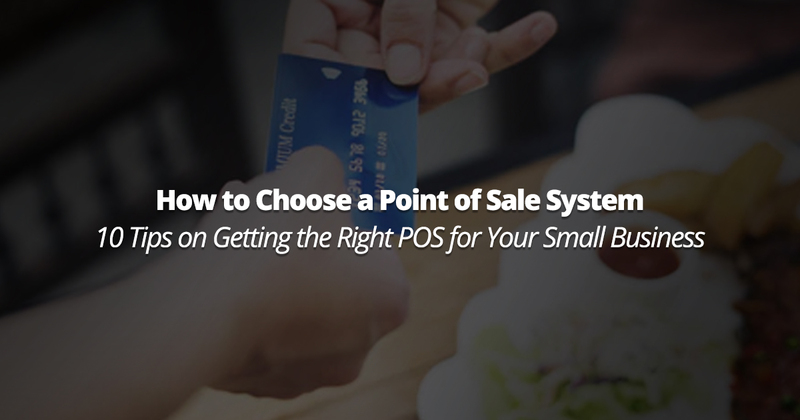 Here are 10 tips and ideas to consider as you research POS systems for your small business. We know the retail industry is extremely competitive. Having an intuitive yet robust point of sale can help you to streamline your business processes, increase revenues, and achieve your business goals. That’s why you’re ready to upgrade to a point of sale (POS) that does more than just process transactions. Your point of sale should be able to take transactions for in-store sales, online sales, build customer loyalty, attract new customers, automate your marketing efforts, and increase your overall sales. Choosing a point of sale that’s a right fit for your business can be confusing and time-consuming. Here are 10 tips that will eliminate confusion and help you understand all the benefits a robust POS system can bring to your business. Studies have shown that retailers can lose up to 14% of customers due to product being out-of-stock. An effective POS keeps your shelves well-stocked; it helps you forecast, automate, and consolidate your inventory management. Over 70% of today’s top retailers are using tablets to provide sales floor support. POS helps create an intimate, personalized shopping experience that builds brand loyalty. Mobile is part of your customer’s buying experience, and it should be part of your sales staff’s as well. The right POS provides customers with speed and convenience, and should go where you go. Don’t let hidden costs sneak up on you. When researching point of sale systems make sure to add up all the costs associated before making a decision. For example, where are you going to keep all your cash? A cash drawer can cost anywhere from $50 – $175. According to the National Retail Federation, 6 out of 7 consumers research products online before buying in a store. And most retailers agree that customers who shop both online and in-store bring in more revenue than those who shop via one channel alone. The right POS helps brick-and-mortar retailers build online stores and sell through any channel. When it comes to buying technology, think about the long-term costs. While it can be tempting to go for the cheapest and simplest system when you’re getting started, you’ll regret it when you outgrow it in a year’s time. Research shows that fewer than 1 in 10 new prospects will make a purchase, while more than 6 in 10 existing customers will buy again. As a result, today’s leading marketers are no longer sending out generic email blasts – personalizing consumer conversations. The right POS helps you get with the times and send relevant communications tailored to your customers’ preferences. Retailers used to “fly blind” – goods came and went, but managers had only a vague idea of profits. In today’s highly competitive environment, retailers can’t afford to take risks. That’s why a good POS will show you how well you’re doing, and where you can improve. Every retailer has their own unique strengths and challenges. A good POS vendor will help you figure out the right software and hardware so the system you end up with is strong fit for your business. Retailers know that employees must feel at least as empowered with information as customers and that smart mobile technologies are the way to accomplish that. A good POS shouldn’t eat up employees’ time or frustrate them with complicated, unnecessary features. They’re the ambassadors of your brand – don’t leave them out of the equation when you consider your store’s technology.